The Australian Mark Frendo claims his second Crocodile Trophy stage on the marathon race from Cairns into Lake Tinaroo and defends his overall leader jersey today. He increases his race lead, winning ahead of the Austrian pro-road racer Josef Benetseder and the Canadian National Marathon Champion Cory Wallace. Liesbeth Hessens was the fastest woman again, showing a strong performance on the gruelling climbs through the Dinden National Park. Most of the riders in the Crocodile Trophy race had regarded today as the real start of the action. After yesterday’s lap race at Smithfield for stage one the 90km marathon race from Cairns to Lake Tinaroo had its official start high above town on the road towards Copperlode Dam and a large lead group of almost 30 riders set a high pace right from the start. After gruelling climbs and steep descends that seemed to never end, the first feeding zone was located deep in the tropical bushland of Dinden National Park and by then an Austro-Australian breakaway group had formed with race leader Mark Frendo (AUS) and the two Austrian racers Wolfgang Krenn and Josef Benetseder. With a gap of only a minute, Cory Wallace (CAN) and the Czech rider Jan Fojtik were in hot pursuit, followed by Matthew Page (GBR), Jiri Krivanek (CZE) and M1 rider Mario Färberböck (AUT). Proofing his strong endurance skills, Josef Benetseder attacked just before the second feeding zone and surprised his fellow riders with an impressive climbing performance. On the steep ascent towards Mount Edith, the highest point in Far North Queensland, he was able to increase the gap to over two minutes, with Wallace and Frendo chasing hard. 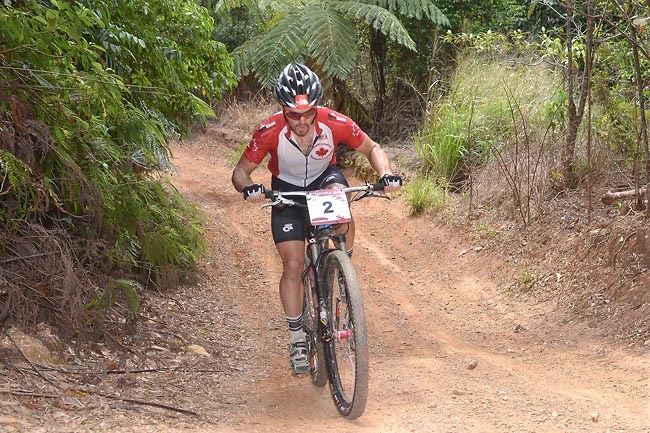 A more than 10 km rapid descend to Kauri Creek was the reward before the finish at Lake Tinaroo and only Mark Frendo was able to catch up, crossing the finish line for his second stage win with over a minute gap. “Benetseder was really strong on the climbs today, but luckily on the last downhill I had an advantage over him”, said the mechanical engineer and passionate mountain biker from Brisbane at the finish who will hold on to the leaders jersey for tomorrow’s third stage to Irvinebank. On the picturesque shores of Lake Tinaroo Wallace finished in third ahead of Wolfgang Krenn and Jiri Krivanek. Very bad luck for Jan Fojtik, the young Czech rider who had started so strongly – sharp chronic pain in his lower back forced him to retire 30km before the finish. Tomorrow’s third stage will be an 80km marathon with more than 2,500m of climbing, featuring a 30km loop on the new Atherton mountain bike trail network before heading towards the historic mining town of Irvinebank across rough Outback roads and spectacular river crossings.